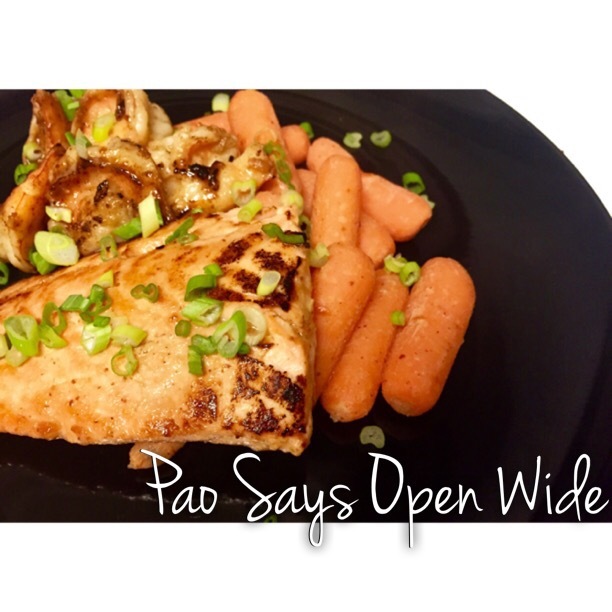 Unda Da Sea: Honey Ginger Salmon and Shrimp with Carrots – Pao Says, "Open Wide!" I’m recently hooked on the series “Once Upon A Time”. After binge watching half a season and finally getting to meet The Little Mermaid, Ariel, I was feeling like dabbling in some seafood. We just bought a ton of salmon and some shrimp, so I made good use of it in this delicious glaze with Asian flavors. Mix the the oil, soy sauce, mustard, honey, and ginger together with a whisk. Once everything is unified (emulsified), pour 3/4 of the marinade over the salmon, and 1/4 of the marinade over the shrimp. You can let it sit in the fridge overnight, or you can just let the seafood come to room temperature while it sits in the sauce (in bowls with plastic wrap)… About an hour or so. Pan fry the salmon on med-high heat. Do not over-cook it! Better for the salmon to be slightly undercooked than overcooked… It’ll turn into a dry, rubbery mess if it’s overcooked. For a half inch thick piece, I gave it about two or so minutes to each side- enough to give it some color. After the salmon is cooked up, set it to the side and cook the shrimp in the same pan. These cook up fast so keep an eye on them! Once they’re pink and crisped (from the glaze), take them off the heat. This should take no more than 3-4 minutes, depending on the size. Garnish with the freshly chopped scallions and serve with rice or a vegetable (I steamed carrots and tossed them in a honey-mustard-ginger mix). **the icon for this blog post shows this salmon and shrimp dish over garlic and herb brown rice… The rice also makes a great side dish!